Cliff Henderson (Robert Stack), wife Laurie (Dorothy Malone) and daughter Jill (Tammy Marihugh) are enjoying a leisurely cruise onboard the SS Claridon headed to Japan. They expect to wile away the days by playing bingo, watching puppet shows and to get in some romantic dancing between Cliff and Laurie. Trouble erupts when an explosion in the engine room cripples the Claridon and she begins to take on more water than the pumps can handle. Laurie gets pinned under debris and now Cliff is on a frantic mission to save her. Panic begins to erupt all over the ship. The ships engineer (Edmond O’Brien) and his team fruitlessly attempt to buy more time and make repairs, but it dawns on him it’s a hopeless situation. As the water levels begin to rise the stubborn captain (George Sanders) is unconvinced of his ships fate and to make it a priority to get the passengers into lifeboats. But it becomes increasingly clear to everyone onboard there isn’t much time to survive on the sinking Claridon. The Last Voyage is one of those earlier precursor’s of the 1970’s disaster craze. 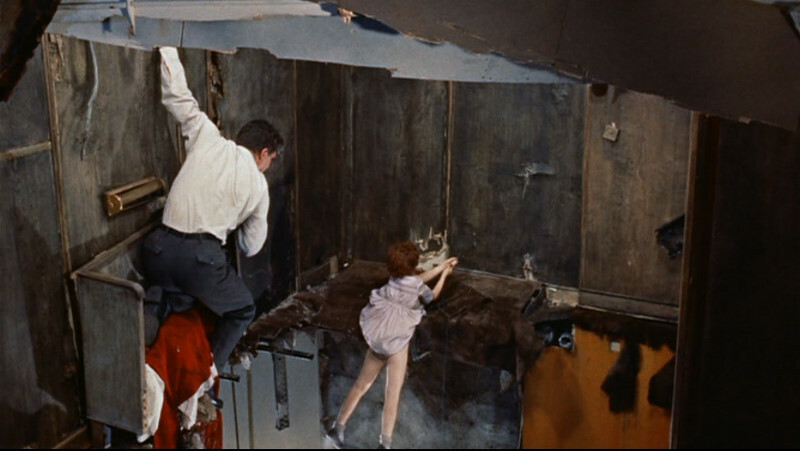 Watching it you can’t help but see similarities between it and The Poseidon Adventure. It makes me wonder if Irwin Allen took inspiration from it before he set out to make his sinking disaster epic. Unlike those 1970’s all-star, multiple character disaster movies, The Last Voyage mainly focuses on three sets of stories – the Hendersons, the engineer and the captain. We don’t get to meet any other passengers and they mainly fill the background running around screaming. But these three sets of characters make for a surprisingly compelling, suspenseful movie. I was really surprised how fast I got hooked into the story. Stack is very good as he runs around trying to get help from anyone and trying to think of any way to free his wife. Frustration mounts as he’s turned away or ignored completely by the ships crew who are dealing with the flooding. Tension amps up waiting to see what he will do next. O’Brien is such a reliable character actor whenever he shows up and once again he delivers a strong supporting performance. Barking orders and yelling at anyone within earshot. And Sanders is such a stubborn fool at some points you just want to slap him. I never felt that things get too cheesily melodramatic, which I was fully prepared for when I started watching ‘a disaster movie from 1960’. 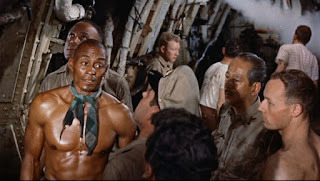 Woody Strobe is a bit too selfless and noble a character, but I was willing to go along with it since he is so likable in this. While watching it I was very impressed with the sets. The damaged engine room, the huge flooding dinner hall, the passengers scrambling on deck for lifeboats. I kept thinking, ‘wow this all looks really, really good. A lot of this doesn’t look like it was filmed on soundstages’. It wasn’t until after watching it and looking up information about the movie I learned The Last Voyage was filmed on a real ship that was scheduled to be scrapped. It was leased by the studio and director Andrew L. Stone partially flooded portions of it for his movie. 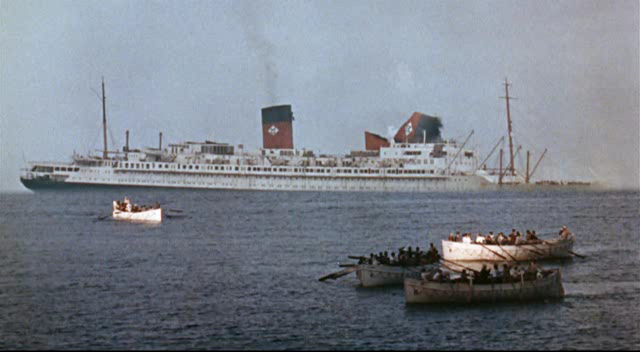 Despite many trivia listings about the movie saying the ship was actually sunk for the filming – that’s not true. It was only partially sunk and after filming was completed it was taken away to the scrapyard. The use of the real location, the time the filmmakers must of spent time creating the sinking effects and how they staged it is awfully impressive and the movie makes the most out of it’s real life set. It might have cost a hefty amount of money, but it really paid off to create a convincing and believable sinking of a cruise ship – which got nominated for the Oscar for special effects that year. There is a silly moment when one of the ships funnel collapses and it seems to come out of nowhere. It was like they figured it would be cool to do, but it doesn’t look very realistic that it would happen at that moment. But what the heck, that’s one quibble amongst a lot of effective flooding scenes. Some of its sequences put modern day over-the-top effect-laden disaster movies to shame. I’m somewhat surprised the movie doesn’t get more talked about or given more attention. I found it a surprisingly good suspenseful film that has some splendid realistic effects. It’s well worth a watch for disaster movie fans. Airport – The Highest Flying Cinematic Disaster Series Ever! 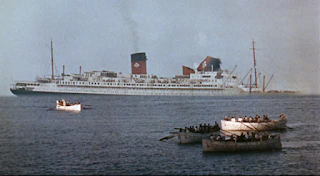 I remember a shot of survivors exiting the ship as part of it was sinking. I think the door got submerged just as they went through it. And I thought "Wow, that's a great shot." Most impressive since this was well before CGI. I'm reminded of that story where Selznic wanted Alfred Hitchcock's American debut to be a movie about the Titanic. Couldn't do it because they couldn't find a ship to sink. But this movie gives us a taste of what could have been. Caught this on cable a while back. 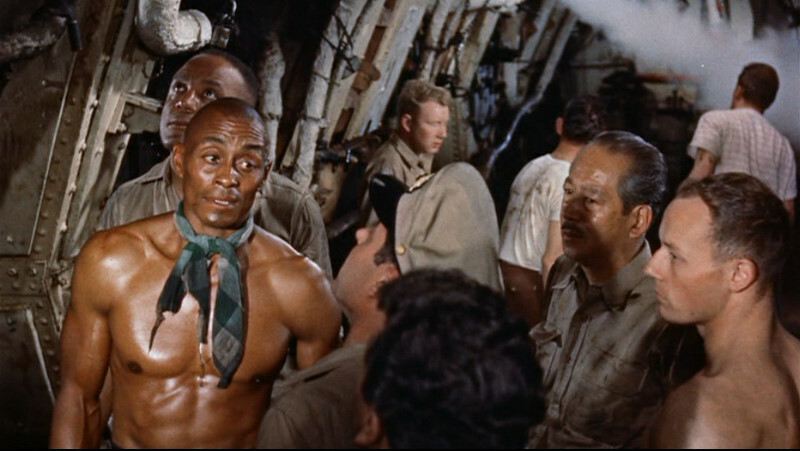 Was into it primarily because of Woody Strode. After reading his biography, I was interested in the films he acted in besides "Spartacus" and "Once Upon a Time in the West." This was a well-made, enjoyable flick with great performances all-around. Thanks for reviewing this. 2012 Oscar Predictions – As If I Would Know….